Sun Mu, as this painter is known, has a greater understanding of the ongoing repercussions of the Cold War than perhaps any other living artist. 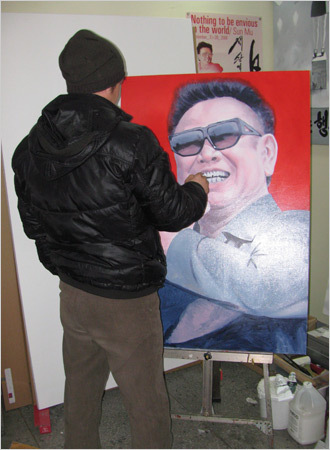 Born in North Korea, where he was trained to paint propagandistic posters and murals, Sun fled in 1998 during one of the country’s many famines, and today lives and works in South Korea. The artist’s real name and appearance are not widely known. Sun Mu is instead a pseudonym, chosen to protect the family he was forced to leave behind in North Korea, and he avoids photographs of his face. He has carved out a noted career, adapting his training as a Socialist Realist painter for the North Korean Army to reveal the melancholy of his native land. Ranging from the satire of a grotesque depiction of Kim Jong Il in sunglasses, tracksuit and uncoordinated Nike and Adidas trainers, revealing the hypocrisy of his brutal regime; to the haunting Manga-style face of a frightened girl, the North Korean flag reflected in her eye; Sun Mu’s work is at once bitingly satirical and quietly chilling, subtlely revealing the failings of an artistic doctrine which dominated the communist world for half a century. You can read a more in-depth introduction to Sun Mu in the New York Times.